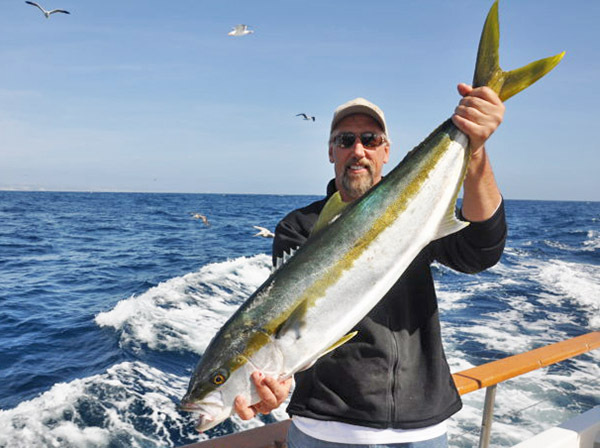 Just in time for the upcoming offshore season, prototypes of the new Axis series rods were previewed at the Fred Hall Show, Pacific Coast Sportfishing Festival, and Day-at-the Docks. This new line covers the full-spectrum of saltwater applications from the 12-30# rated HAX 680 ML, which will be perfect for fishing the Anchovy all the way up to the 80-200# rated HAX 780 X4H, which is designed to be a player in the rail-rod application for big tuna. 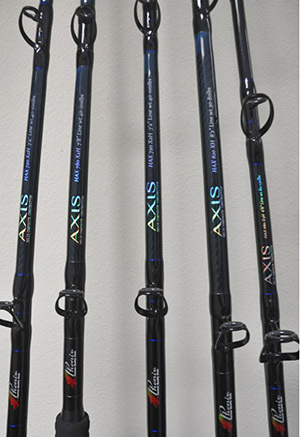 The Axis is a sick looking rod with its dark blue blank color and backs it up with a high-tech helix composite blend of S-Glass, T-16 Carbon-Fiber, and Graphite. The S-Glass is what distinguishes this rod from the proven Black Diamond series. Available lengths vary from 6’8” up to 8’2” and are all one-piece design. The Lighter models will feature Alconite guides, high-density EVA grips, and Fuji reel seats. The heavyweights will have Silicon Nitride guides, Hypalon grips, and aluminum reel seats. 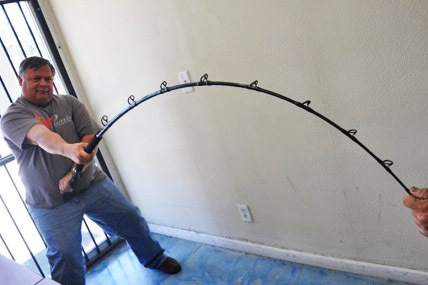 Mel Fai, Director of Sales & Marketing for Phenix Rods, demonstrates the power and action of the Axis. I was able to check the prototypes out at the Fred Hall show and was impressed with the power-to-weight ratio and the more parabolic bend that the S-Glass gives them. Think of a Phenix Black Diamond that mated with an old-school Sabre rod and the resulting ‘hybrid vigor’ that results is the Axis! Stand-by for additional updates from BloodyDecks, once the production rods are available and some ‘clinical’ testing is performed.